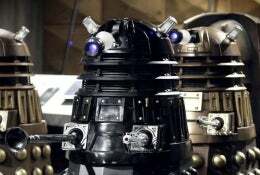 Has Russell T Davies Destroyed The Daleks? Rose Tyler's absorption of the Tardis vortex allowed her to disintegrate every Dalek in existence (apparently), which was a sudden plot twist that tied in with the ongoing 'Bad Wolf' story arc. Fast forward a year later and the Daleks are out in force and dominating the Earth's skies. Rose Tyler pulls a lever and suddenly all the Daleks (except the Cult of Skaro) fly into the Void and out of reality. Job done. Most recently in 'Journey's End', Donna Noble has to flick a few switches in the Crucible and, shock horror, the Daleks go doolally and blow up. All of them. In seconds. Again. [T]here's a danger of returning to the days when Daleks would scream "exterminate" several times until their intended victim was able to escape. This happened to both Wilf and Sarah Jane in the latest season finale, although one trigger-happy Dalek at least managed to strike The Doctor with a glancing shot. Still, even that didn't do much damage. Are they starting to fire blanks?